Sarah McBride is the National Press Secretary for the Human Rights Campaign and the author of Tomorrow Will Be Different: Love, Loss, and the Fight for Trans Equality. 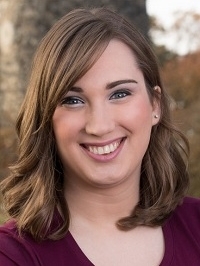 In 2012, Sarah made national headlines when she came out as transgender while serving as student body president at American University. A native of Wilmington, Delaware, Sarah serves on the Board of Directors of Equality Delaware, the state’s primary LGBTQ-advocacy organization. In that capacity, Sarah helped lead the successful effort to add gender identity and expression to her state’s nondiscrimination and hate-crimes laws. In 2008, Sarah worked for Governor Jack Markell (D-DE) and, in 2010, for former Attorney General Beau Biden (D-DE). Prior to coming to HRC, Sarah worked on LGBTQ equality at the Center for American Progress and interned at the White House, the first out trans woman to do so.